Looking to buy something that will keep on giving? Consider airline stocks. They have been doing incredibly well lately, but they aren't even close to achieving maximum altitude. At least that's what Morgan Stanley (MS) says about the airline industry, which has doubled the broader market by surging a whopping 115% since the start of 2013. 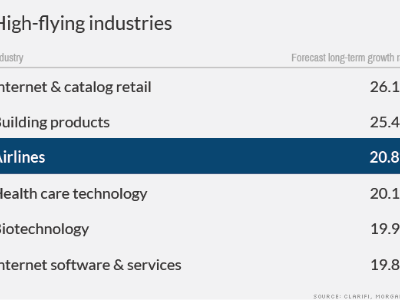 The rapid ascent has been fueled by a major transformation in the industry that's reshaped the competitive landscape and boosted profitability. So did investors completely miss the flight on these red hot stocks? "It isn't too late," Adam Parker, Morgan Stanley's chief market strategist, wrote in a recent note to clients. "We think this is an earnings growth...story that is much closer to mid-cycle than end of cycle." Cheap valuations: Of course, there's no guarantee Morgan Stanley is right. A geopolitical event or an oil price shock could ground these stocks. However, this group does look cheap based on their projected profits. Despite their meteoric rise, airline stocks trade at just 10 times forward earnings, compared with a multiple of 17 for the broader market. That disparity shows how the industry is having a hard time shedding its image as a nightmare for investors, even legendary ones like Warren Buffett. The Oracle of Omaha once blamed a bet on US Airways on "temporary insanity" and today he avoids airline stocks like former NFL coach John Madden avoids actual airlines. Related: Will 2015 be the ho-hum year for stocks? Not your father's airline industry: Airlines got such a bad reputation because financial stress left many of them in bankruptcy court. But in recent years they've made huge strides in fixing their problems, especially slashing leverage and cutting benefit obligations. The industry has also gone through a ton of consolidation. Legacy airlines have teamed up through mergers and joint ventures. Even low-cost carriers are consolidating. Those structural changes make it much more difficult for new entrants to break into the industry. Remembering mistakes from the past, airlines have also been very conservative with adding capacity in the form of new planes with lots of seats. In other words, supply has gotten out of whack with demand. That's good news for airlines' bottom lines. "We believe the combination of conservative capacity growth and increased concentration sets the stage for a more robust profitability cycle than the industry has seen in the past," Morgan Stanley wrote. Profits poised to soar: Out of all 60 industries in the stock market, airlines sport the third-highest long-term growth rate at 20.8%. That puts them somewhat below fast-growing Internet companies, but above other darlings of the stock market like health-care technology and biotechnology. Consumers won't like to hear this but Morgan Stanley thinks airlines can further juice their profits by jacking up fares, which have been on the rise despite lower costs. The bank argues air travel is "cheap" today by historical standards and the economy can absorb more airline real price growth. So which airline stocks is Morgan Stanley high on? 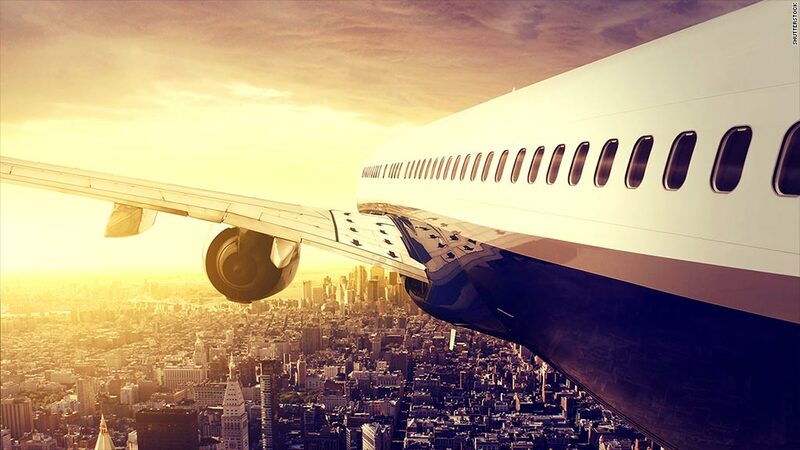 The bank's quantitative analysis gave the highest marks to Delta Air Lines (DAL) and JetBlue Airways (JBLU), each of which have flown 60% higher this year.